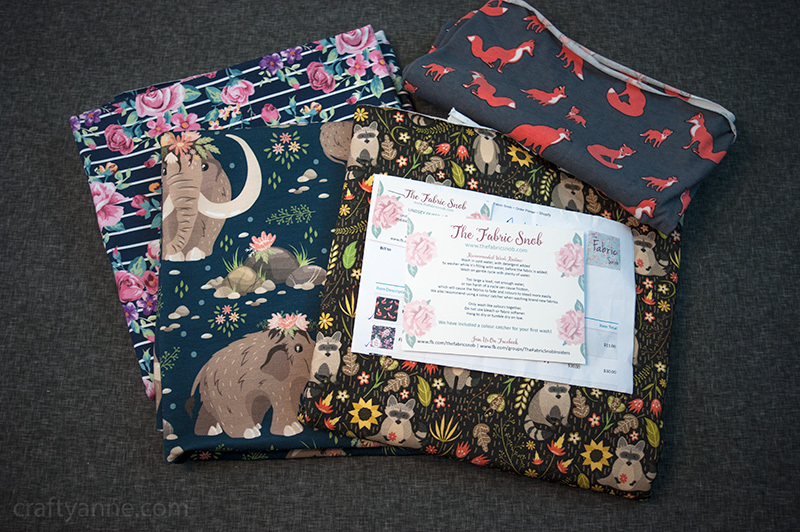 The Fabric Snob is a small business that stocks gorgeous printed knit fabric alongside other types of fabrics (flannels, windpro, quilting cotton.) I’ve been meaning to post about this for some time now. I purchased a few yards of fabric from The Fabric Snob and wanted to share my experience with them since I haven’t found much on the net about them. If you’re wondering where to buy pretty fabric, this is the place to buy it! Disclaimer: post has affiliate links. I purchased the fabric with my own funds. 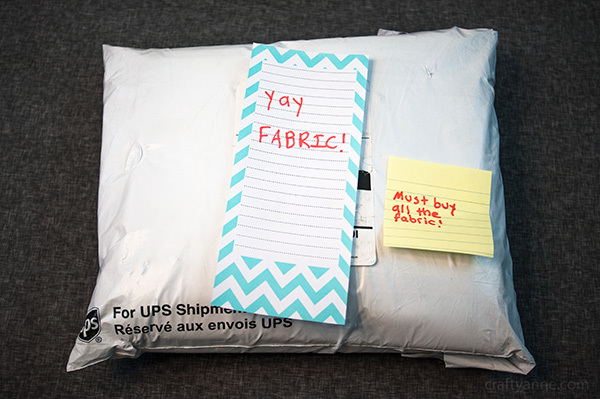 The Fabric Snob is based in Canada, and the fabric got here in good time. Shipping was very reasonable, she charges a flat $9.99 per order. 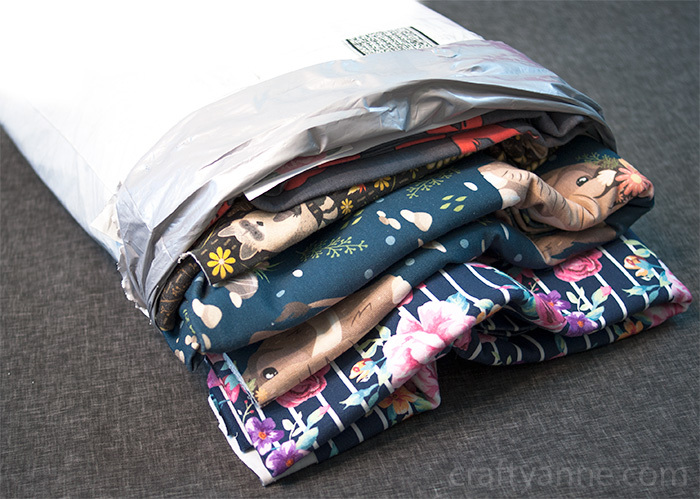 Fabric orders can get heavy and expensive very quickly. 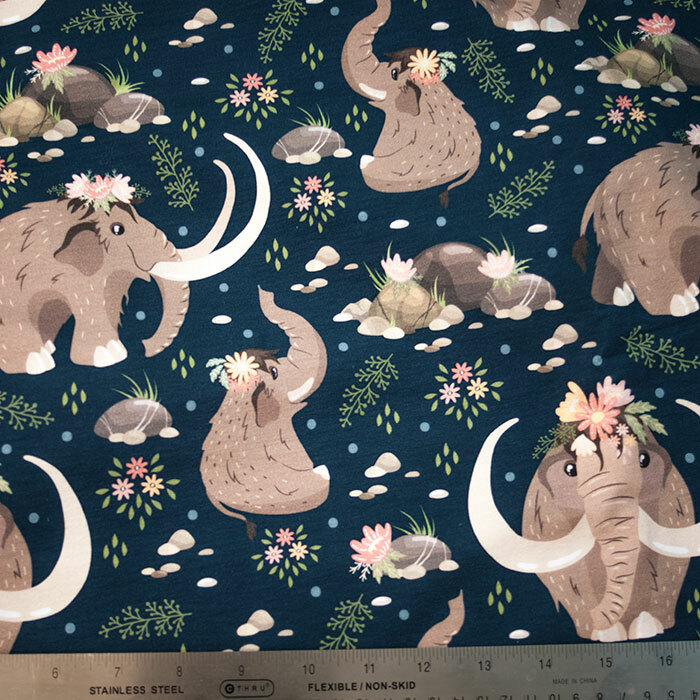 The crown jewel, my woolly mammoth fabric! My favorite would have to be the woolly mammoth fabric. I accidentally ordered this in french terry rather than cotton lycra but it ended up being a good mistake. French terry is softer and thicker than regular cotton lycra. It has a really nice stretch to it, pretty much as stretchy as regular cotton lycra. The back has a slightly looped texture; it’s slightly spongy but not anywhere near sweatshirt fleece territory. This was my first time encountering French terry in real life! I imagine this would be an excellent cotton knit fabric for babies. I think I’m going to make a pair of leggings to wear in the fall, because doesn’t everyone need woolly mammoth leggings? 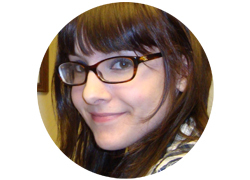 Up next is the raccoon knit fabric, in a cotton lycra blend. The print is nice and crisp, especially considering the smaller print scale. And then this meter of floral stripe fabric (cotton lycra knit blend.) 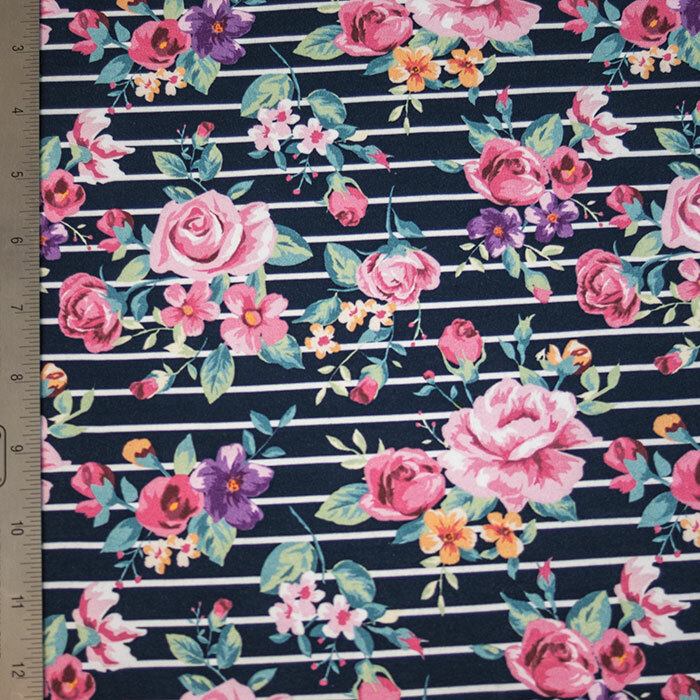 The pink roses and pastel flowers are set off well by the deep navy blue stripes in the background. I hope they’ll be stocking this pink watercolor rose stripe fabric again so I can buy another length to make a dress. I’m missing probably the most important part of the review: what happened to the fabric? What did I sew? 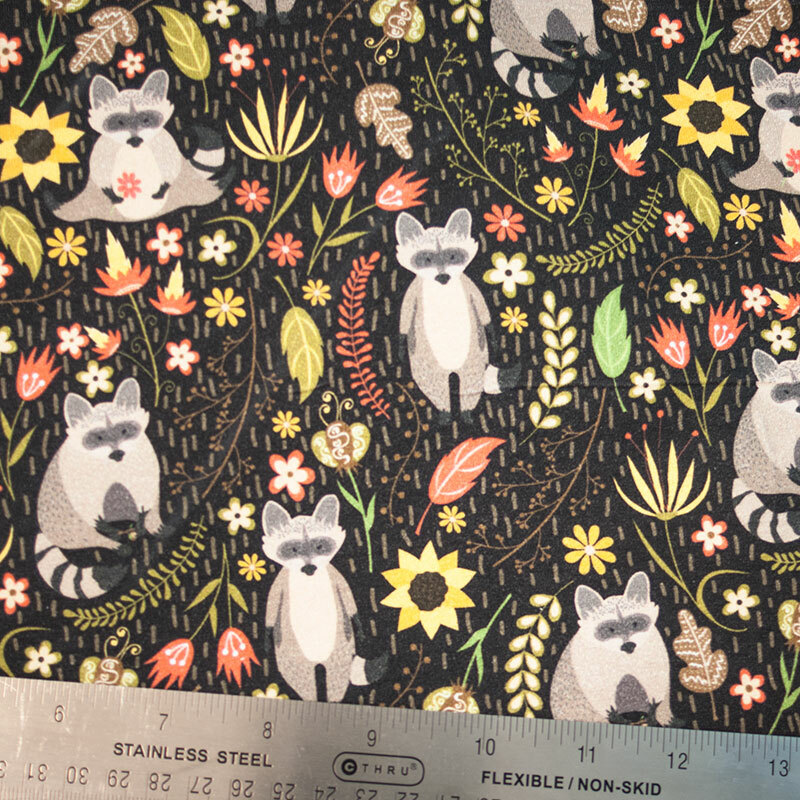 Well… it’s currently in my fabric hoard because I can’t decide for sure on what to make with it. When I’m finally able to decide what to make I’ll add an update and a link to my post.